In the case of an emergency. having a competent, efficient and effective gas well site construction and environmental services company on-call is not just important. it‘s a necessity. CT’s Emergency Response Service offer a rapid and effective response to spills of tracking fluid, diesel fuel or any other hazardous waste. CT’s land based Emergency Response equipment and trained personnel are available 24 hours a day. seven days a week. CT owns over 150 pieces of specialized cleaning and transportation equipment. We utilize three operation centers, enabling us to respond quickly and efficiently no matter where the problem is located. CT’s goal is to minimize clients’ liabilities, negotiate with regulators and cost-effectively address every aspect associated with gas drilling emergencies. In an emergency situation, CT will always be there to perform all of the necessary response services from clean-up to excavation work to soil and waste disposal. Over the past 10 years. 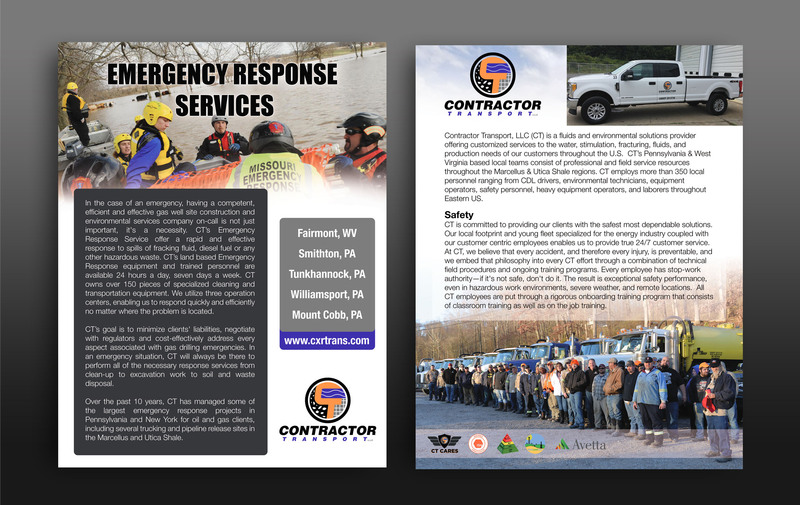 CT has managed some of the largest emergency response projects in Pennsylvania and New York for oil and gas clients, including several trucking and pipeline release sites in the Marcellus and Utica Shale.